I'm working on a Minecraft like game engine and recently I've been trying to add good collision response which I have kind of. The collision response is perfect when I try and go through the right side or front side of this cube. I'm doing a dot product between my player's velocity vector and the normals for each side of the cube (ex: new Vector3f(0.0f,1.0f,0.0f) //Up) and seeing which normal gives the dot product which is the greatest and then I multiply my velocity vector by that normal vector in order to create this cool sliding effect. This sliding effect only works for the right and front sides of the cube and the rest of the sides have a weird effect which is not sliding at all. Anyway if anyone can help with this it would be very much appreciated :). 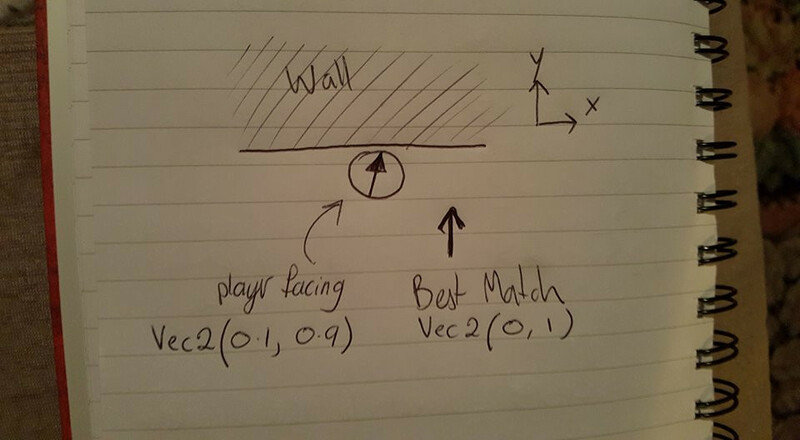 This is my method for detecting collision which works efficiently. Then there's the method for detecting which way the player should slide which is called velocityDirection. Update: Whenever I try and touch ANY side of the cube (I am printing out the variable BestMatch from the velocityDirection class which is one of the normals from the array of normals) it returns a value of Vector3f(0,1,0) and when I try and move and go through the right side like a ghost it returns Vector3f(-1,0,0) and for the front side it returns Vector3f(0,0,-1), and remember the right and front sides both have perfect collision. In the above diagram we are looking top down on the scene, and the best match for the players direction (or velocity) is the y-axis, but we probably want to slide horizontally. My first time implementing wall sliding in a FPS was from Mark Overmar's FPS tutorial for GameMaker, it's 10 years old but it's full of great gems. Here's his wall sliding code (modified for clarity). Also: Are you doing AABB tests against every block in this voxel world? this could get costly. You could improve it by reformulating the ANDs into ORs (with De Morgans theorem) and get early termination (short circuiting), so that when a single comparison is true, the function can return false without having to evaluate all 6 conditions. Since it's more likely that a block is NOT colliding with the player. Not the answer you're looking for? Browse other questions tagged collision-detection vector lwjgl collision-resolution aabb or ask your own question.